When you are not a vet yourself, but want to medicate your pet, it becomes extremely important to know the right dosage. CBD is getting increasingly popular as a pet medication because it has a great power to treat a variety of ailments in animals. However, once again the right dosage is extremely important. 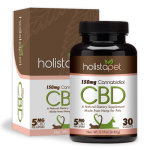 Having a Holistapet’s CBD oil for dogs dosage chart at hand is very helpful to find the right dose. What Should You Consider while Treating Your Pet with CBD? Remember that several factors can affect the right dose of CBD for your pet’s requirements. For example, the type of product you use also influences this. CBD medications are usually available in 3 types – capsules, oils and treats. Another factor is your dog’s size. This means that a larger dog will need a larger dose and a smaller dog will require a smaller dose. It becomes easy to find the dose when you buy high-quality products because often you get their own dosage charts specific to their products. Finally, your dog’s ailment will also decide how much CBD you should give her. Typically, CBD capsules contain 5 to 20 mg of CBD each. While the exact number of capsules to be given varies from product to product, in general, one tablet is to be given 1-2 times every day. CBD oils, on the other hand, are administered in drops. Again the exact number of drops may vary from product to product, but usually the dosage is 2-4 drops to be given 2-4 times every day. Unlike capsules and oils, CBD pet treats can consist of different concentrations of CBD and therefore you should follow instructions on the package exactly. It’s recommended that you should follow the dosing instructions available with the product while using any type of CBD, and then see how your pet responds and then adjust the dose accordingly. How to Give CBD Oil to Your Pet? Ideally CBD oil has to be administered straight into your dog’s mouth, preferably under his tongue. As, generally, dogs are not very fond of medications, this can be a little tricky affair. However, you have to be patient and your dog may get used to the medication routine and even may love to lick it. If that’s not the case with your dog, you may try to reward the dog with her favorite treat if she takes the medicine properly. If even that doesn’t work, you may try CBD capsules which you can wrap in the dog’s food or CBD treats. Make sure you give your pets the right dosage and look forward to watching them getting well.